...Sported Painted Hair, Painted Eyes, Glass Eyes, and Mohair Wigs! Tin Or Metal Head Dolls If their paint had been as sturdy as their composition of metal these dolls would survive indefinitely. Heads molded from a sheet of tin (or metal), they are usually found on kid leather or all cloth bodies. Tin heads were sold separate from bodies, advertised in many old catalogs, therefore an old cloth handmade body is appropriate. The most familiar name relating to tin head dolls is Minerva. They were manufactured 1894 through 1925 and perhaps a little longer. Registered trademark in the U.S. by A. Vischer & Co. and in Germany by Buschow & Beck. 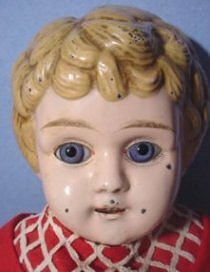 eBay has a rather large set of listings of vintage Metal Head dolls for sale, if you are interested in a purchase, or to find values if looking for costs, it is necessary to register with eBay. Many companies including Borgfeldt and Louis Wolf & Co. distributed Minerva. 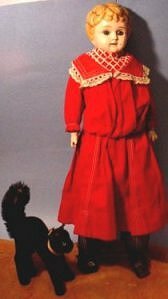 Old Sears and Roebuck catalogs had many illustrations of these nearly indestructible dolls throughout almost 25 years. Tin Or Metal Head Dolls were sold with painted hair, painted eyes, glass eyes, and mohair wigs. There is also a sleep eye version. They were also more affordable than the bisque dolls. It is only recently that doll collectors have started to appreciate the unique quality of these simple tin or metal head doll children. Years ago they were on the bottom of the list of popular dolls, now they have a firm position in the history of doll making. This particular glass eye metal head is marked only Germany. Her attire is complete down to her pantaloons and camisole which contributes to her charming demeanor. Who can say if her clothing is original...but it has been on her long enough to take the form of her body, and she is dressed as she was discovered in a Montana estate. Actually, this is the only metal head doll I have ever purchased for my own collection! Maybe she needs a friend... Information regarding Tin Or Metal Head Dolls can be found in a multitude of books. Welcome to "Show and Tell" for early Tin or Metal Head Doll! "Show and Tell" your favorite Vintage Metal Head doll. We all have an interest in how they were located, the use of materials in their clothing and anything else you would like to share with other avid collectors.